Las Vegas is located in the Mojave Desert, in Clark County, Nevada. As you’d expect, the weather is warm and the sun is always shining. With plenty of entertainment, glorious sunshine and cloudless skies, Las Vegas is the perfect holiday destination. Whatever your reason for travelling to Vegas, there are a few options in getting there. You can either fly there directly to Vegas’ McCarran International Airport or include it as part of a bigger USA adventure. Perhaps hire a car and take the 270 miles drive from Los Angeles or opt for the cheaper and real American experience, and travel by Greyhound bus. One of the most fun aspects of planning holiday in Vegas is choosing exactly where to stay. Vegas is unlike any other holiday, or business, destination as your hotel is more than your accommodation, it is a holiday in itself where you’ll find mini worlds and cities to explore and adventure. For starters, there is no other place where you can travel from New York to Venice to Ancient Rome all in the space of a morning, whilst fitting a visit to the circus and a medieval castle! The choice and reputation of these spectacular hotels can be overwhelming, so peruse Vegas hotels with Trailfinders to make it all that little bit easier! Once there and settled into your hotel, you’ll be spoilt for choice on what to do next. 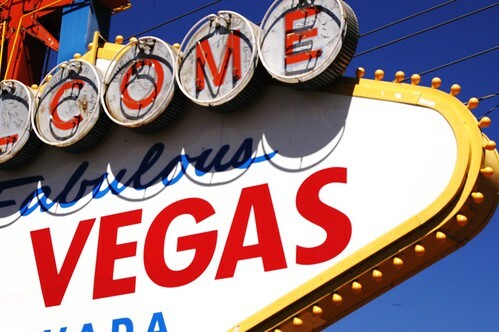 A walk along The Strip will take you a day and then each hotel provides nightly entertainment in addition to their world famous gambling offer. With all night dinners and the chance to have a flutter on the slots 24/7 – finding time for your beauty sleep will be the hardest thing you have to do. There are also plenty of opportunities to take a trip out of the city – you can take a day trip to the Hoover Dam where you can cross time zones in a footstep as it sits across both Pacific and Mountain Time lines. Or take a scenic helicopter flight to the Grand Canyon West Rim from Las Vegas airport for less than $200 – a spectacle really not to be missed. And of course, if the mood takes you and your beloved, there are plenty of chances to get hitched. Here in Vegas, you can even opt for a drive-through wedding or get married by the King himself. Only in America!